Our graduation stoles are an excellent way to help your group or club stand out during your graduation. We have a navy blue stole with gold trim that is simply remarkable. When it is time to get your graduation gear in order, Honors Graduation has you covered. We have just what you're looking for to help your important day go as smoothly as possible. It takes a great deal of sacrifice to reach your goals successfully and make it to graduation. You will want to look the best you can when you are accepting your degree or diploma. Your whole family and all of your friends will be there to help you enjoy this memorable celebration for your success. Graduating students usually stick to the tradition that has been in place for a number of years now. They dress in a graduation cap and gown at the time of their graduation ceremony. Many students also wear accessories in order to help pull their outfit together. Here at Honors Graduation we have package deals to bring you the necessities that you need as well as all of the accessories you're looking for to complete your graduation attire. 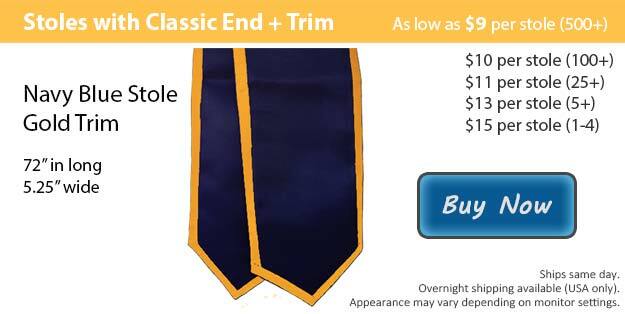 Our graduation stoles are available with the classic cut or with an angled finish. At Honors Graduation we have eighteen exceptional colors to choose from for both the stole trim and the actual stole color. Stoles may also be purchased without the trim as well. Mix and match or stick with a single color to create the perfect stole. We can help you personalize your stole as well. Our customization team uses embroidery to add the image or wording of your choice to your stole. After your graduation ceremony is over, your graduation stole makes for a fantastic keepsake to hang up on display.